Scott Living captures the sophistication of British military campaign furniture with the modern design of the Artesia king storage bed. Handmade from exotic hardwoods and veneers, this platform bed flaunts an eye-catching slatted headboard in an inviting dark brown finish. 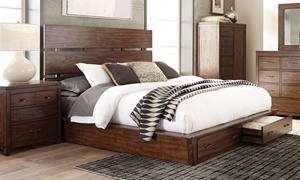 The footboard of this king size bed also comes equipped with two English dovetail drawers on full extension slides, a great way to expand the storage space in your bedroom.